02. Why you created EuroSinging? 03. EuroSinging supports 64bit operating systems? 04. How to: Create a contest? 05. How to: Edit a contest? 06. How to: Delete a contest? 07. How to: Add a new participation? 08. How to: Edit a participation? 09. How to: Create an update file and execute it? 10. How to: Add multiple multimedia files to database automatically? 11. How to: Recover database to a previous state? EuroSinging is a freeware offline database for Eurovision Song Contest. Freeware means that you can download the full program for free and you can give it to anyone you want. The only restriction is that you can't alter the source code of the program and of course, you can't sell it. The idea of EuroSinging started on 1997. I wanted a program with all information about the contest in Dublin, lyrics and some gossip about this contest. I created a program for this exact contest and then, two more programs for 1998 and 1999 contests. I then decided that it wll be better to create a general program for all contests and all Eurovsion history. The first version of EuroSinging was released on 12 January 2002. Yes, EuroSinging v 3.3.0 and above support 64bit systems. Version 3.2.0 and below does not support 64bit systems. First of all, ensure that you have selected the "Contests" tab of the left lists. Right click on a contest and choose "Add Contest". On the new window write all required information and click "OK" when done. The new contest is created and you can select it from the left list. Both semifinal and final date must be of the same year as the year you want to add. If the contest already exists, a warning message will be displayed. Double click on a contest on the left list or right click and select "Edit" to edit this contest. You can edit all information and even change the logo of this contest. Right click on a contest and choose "Delete contest" to delete it. All participations and information of this contest will be deleted, but the multimedia links of this contest will remain in the database. You can add a new participation to the new contest you created or to an existing one. Select the contest and right click to the list of participations. Choose "Add Entry". Fill the requred fields of the first tab. Required fields are Country, Song Title, Artist, Composer and Lyricist. If the country have participated only to the semifinal uncheck the "Final entry open" checkbox. 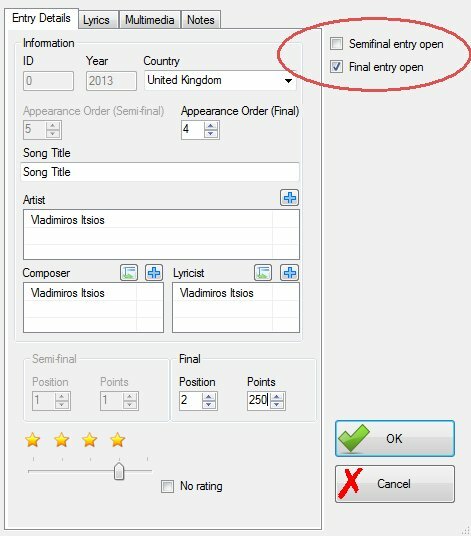 If the country have participated to the final, uncheck the "Semifinal entry open" checkbox. Otherwise, leave both of them checked. If you want to add multimedia files, go to the Multimedia tab and either click on the Add button or drag n' drop files to the appropriate list. When you drag n' drop files, a menu appears. Select "link to dropped file" to create a link to the location of the files. Select "copy dropped file to the default folder, then link" to copy the files to the default pictures, music or video folder (as selected on the Options menu) and then create a link to this location. Note that this feature won't work if you haven't selected a country for the participation. Same as above! Right click on a participation and select "Edit" or press F3 to edit it. Use this feature mostly for adding multimedia files or notes, as most of the information are already there for you from the "official" source. Updates files of EuroSinging 4 are different than these of EuroSinging 3. They have different structure and extenstion (.es4). Updates files are used to add the participations of a new contest to the database. They don't contain multimedia files, the logo of the contest or lyrics of the songs. Add these files by downloading the Data Files Package. Right click on a contest on the left list and select "Create update file" and the file will be created. Press OK to display it on explorer. There are two ways to execute an update file. Select "File->Import from update file" and select a file or double click directly this file without opening EuroSinging to start program and run the update automatically. You can add unlimited multimedia files to every participation by editing it, but a clever way is to use "Find orphan files" option. Go to "Tools->Find orphan files" and a new window will be displayed. Choose the type of multimedia you want to search for (Pictures, music or videos). You will see the files that are not connected to participations to the default multimedia folder (as selected on Options). Click the folder path to select the folder where your new multimedia files are. Backup database if you want to make major changes. You never know if you want to undo these changes. After creating a backup file from "Tools->Backup/Restore", you can restore it anytime you want. Note that there is also an autobackup procedure executed before major changes to the database, as running an update file or transfer links from EuroSinging 3.